The idea of moving to a tropical island sounds like a dream come true! But, of course, there are plenty of logistics to worry about with any sort of house move. 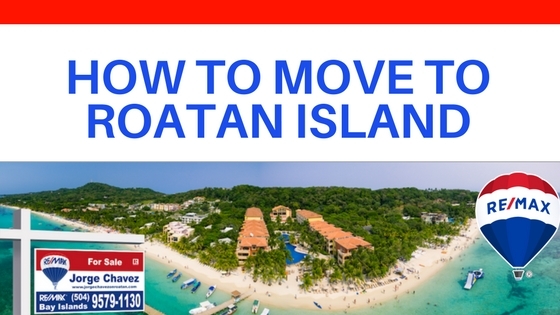 Here are some important tips on how to move to Roatan island, with insights specific to our beautiful slice of paradise in the Caribbean. Roatan enjoys excellent connections with the U.S. and Canada via direct international flights. This makes your journey much easier than it could be for such a small island! We also have many options for cargo to be shipped from the U.S. or elsewhere in Central America. If you’re moving here full-time without keeping a home or storage unit back home, then it’s especially important to consider your packing and shipping options. The best thing to do whenever you move home is to minimize – you don’t want to just take everything without considering its value in your new home. There are several notable shipping options for sending your belongings to Roatan. A few you might recognize, while others are Honduran-based companies. DHL and FedEx deliver to Roatan, with an office across the street from the international airport collecting and holding items for pick-up. This option is best for small shipments, like small Amazon deliveries or important paperwork. Island Shipping and Dip Shipping are two other popular options for shipping items to Roatan. Both of these are local companies that offer excellent service for crates and pallets to be brought to Roatan. Carefully consider what you might actually need versus just shipping your whole home. Remember that this is a tropical island, likely meaning a different climate from what you’re used to experiencing. That affects what you need to bring as well. For example, electronics will deteriorate more quickly in salt air, so if you’re moving to a beachfront home you want to consider the types of electronics you might import. If there’s no way to repair any issues in Roatan, is it worthwhile? If you have questions about shipping certain items to Roatan, feel free to contact me anytime! If you’re bringing most of your belongings with you on the plane, it’s important to pack carefully. You can check in several pieces of luggage, but you’ll want to ensure that what you’re paying to bring is worthwhile. Remember that we do have plenty of options for shopping on the island, plus easy access to the mainland for other items. You aren’t moving to the middle of nowhere with zero options to replace or buy new clothing. Remember also that Roatan is a rather casual island. You don’t need to bring all your black tie formalwear here! Flip-flops and casual summer attire are absolutely appropriate year-round. You’ll want a waterproof jacket with a hood for rainy season, along with some cold-weather clothes. You’ll be surprised, but once you live here for a little while, even 70 degrees Fahrenheit (21 Celsius) will make you shiver! Pack what you need, but know that your lifestyle here will be different than back home. You’ll be outdoors more often than in front of the TV and you’ll be spending time with friends regularly. It’s the island lifestyle we all love! Do you want some more tips for moving to Roatan? Be sure to check out the rest of my blog with tips for potential expats in Roatan. You can also reach out anytime with questions – I’m more than happy to help!